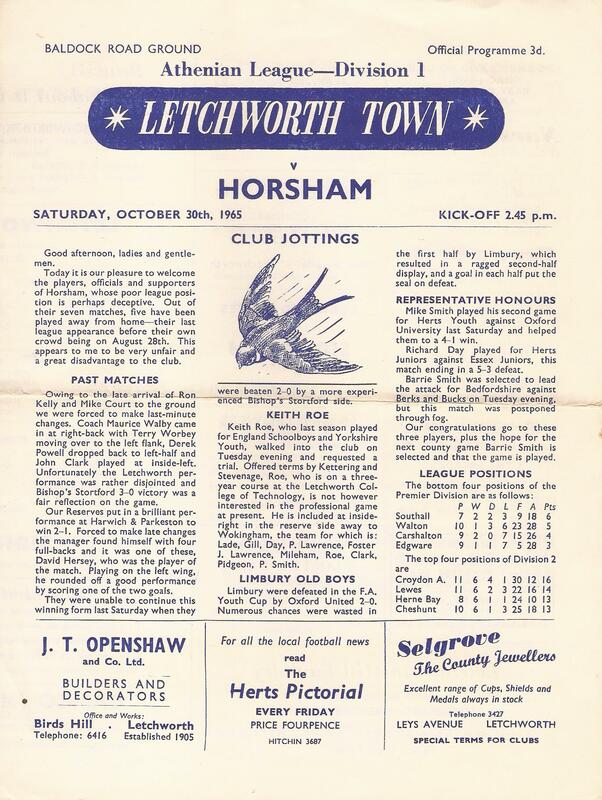 Horsham were sent spinning to their biggest defeat for over eighteen months by a rough and ready Letchworth side and the irony of it was that Horsham played their best football, and showed more power and determination, than for weeks. Both backs, Geoff Crowther and John Grant, surged up with the attack, strengthened by the inclusion of left-half John Dipper and there was a quick flow up into attack and back into defence, passes found their men in space and there was some excellent footwork. It was unexpected against a team fourth in the table, from a side languishing in the relegation zone, but Horsham were clicking at last despite having to play against a strong wind and with the sun in their eyes. It was a heart-warming experience and when Mick Browning hit a post and the ‘keeper following a couple of strong runs in the opening minutes, the hopes of chairman Leslie Hale, team manager Peter Farhall and the Horsham eleven were high. The seemingly impossible – a couple of points to drag them away from the foot of the table – was a possibility, however remote. Especially so when Horsham took the lead when a fine throw by ‘keeper Keith Etheridge went straight to the feet of Browning, who had moved out to the right wing. The centre-forward switched it quickly to Ken Awcock, waiting in the middle. The former half-back brought the ball under control with his knees before guiding it wide of the ‘keeper. It was a great moment, but soon it was to fade as trainer Harold Burst dashed across the pitch to where right back Crowther was staggering after chesting down a throw from Etheridge. He was helped off the pitch with a rib probably cracked, the result of an earlier tackle. It marked the beginning of the end for Horsham who, however, merited the greatest praise for never ceasing to ﬁght, and attack, until the end. They were inspired in their ﬁght by the courageous Crowther who came back after attention to play first in his original position, and then in the attack, despite being in obvious pain, but ﬁnally went to hospital at half-time. 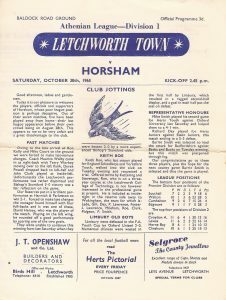 Horsham‘s plight was not helped when Roy Mobsby got a painful ankle injury and winger Peter Harris was brought down heavily by the left-back, who received a lecture from the referee. As if this was not enough for a team trying to pull themselves together and climb the table again, the strong wind chipped a corner-kick from left-winger Cox through Etheridge’s ﬁngers into the net for the equaliser. Nevertheless Horsham continued to play much better football to stay on equal terms until just before the interval when inside-right Davis slammed in Cox’s pass to put Letchworth ahead. Inside-left Powell made it 3-1 from the penalty-spot soon after the interval, after centre-half Brian Riggs had saved a certain goal with his hands. lt was soon after this that Mobsby was helped off the field but limped back after attention. Now badly handicapped, and with inside-right Davis obviously unhappy deputising for Crowther, the visiting forwards lost their rhythm, began to bunch in the middle and so were easily contained. Gradually the strain of having to play with virtually nine men began to prove too much and, after centre-forward Barry Smith had rapped the crossbar and Etheridge had saved well from the same player, Smith managed to force the ball past the ‘keeper in a goalmouth melee. Browning still made the occasional break and he almost beat the ’keeper to a long ball but he was obviously tiring after leading – and scoring twice for – the Athenian League first division attack against the premier division in midweek. But no-one expected the visitors to crack as suddenly as they did. With ten minutes to go Letchworth suddenly struck three times in as many minutes. First Cox cracked the ball in after a shot had been blocked on the line. Then Barry Smith went straight through to make it 6-1 while Horsham were still reeling. It was all a little too much for Riggs, and he conceded another penalty immediately afterwards which Powell converted.